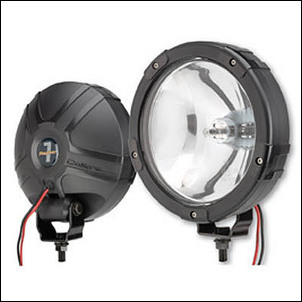 The longer the range of ancillary driving lights, the better needs to be the mounting system that locates them. In four-wheel drives of the SUV variety, that’s not so much drama – those cars (here in Australia) usually have a roo-bar fitted and this makes for a solid mount. But what if you own a sedan and don’t want a roo-bar (or a nudge bar) bolted to the front? It’s very easy in that case to end up with lights that vibrate all over the place. 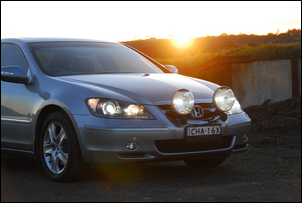 Well, hold on as we make a mounting system to fit two huge Narva 225 HID driving lights to a 2006 Honda Legend. With some uniquely applied vibration reduction technology, it’s not for the faint hearted! As with nearly all cars of the last 15 years, the Legend uses a plastic bumper cover that has no structural strength at all. 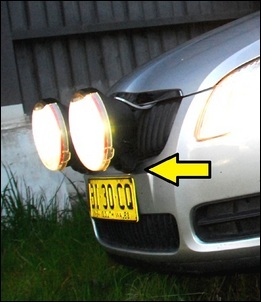 This means that attaching lights to the bump cover, or to the number plate mounts (commonly done via the pictured small, right-angled plate), is a recipe for disaster. Mounted in this way the lights may fall off, and they will certainly vibrate in a way that will drive you mad. Especially for HID or powerful halogen pencil (long-range) beams, any change in angle of the light (as occurs when the mounting is flexing) will cause the beam to move. Worst is when the mount is vibrating so much that the beam constantly flickers up and down up at high frequency. This type of light movement is impossibly distracting to the driver. Obviously then, you need a very stiff mounting point for the lights. 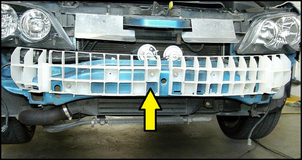 Behind the bumper cover you’ll find an intrusion beam, sometimes covered with a collapsible plastic. The beam behind the plastic makes a stiff mounting point for driving lights. Trouble is, on some cars getting the bumper cover off can take several hours – and is especially difficult if you don’t know where all the (often hidden) screws and bolts are. It’s also very easy to scratch the side panels or the cover itself. An alternative approach, one that I’ve now taken on three cars, is to make a frame that fits behind the grille. 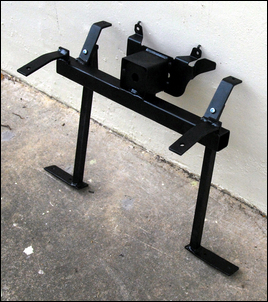 This frame attaches to solid mounting points on the car. The driving lights in turn mount on projections from this frame that pass through (original) openings in the grille. This approach has several advantages. 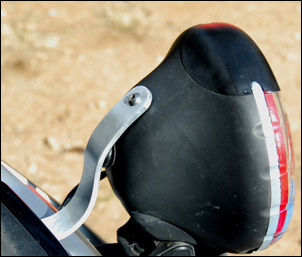 If the frame is made correctly and the body pick-up points are strong, the driving light mounts will be rigid. The lights end up mounted fairly high (good for lighting-up the road) and the lights are removable without leaving any mark. This is the approach that I’ll take in this series with the Honda Legend. A slight variation on the above approach is to drill single holes in the bumper cover, allowing long but thick threaded rods to pass through the cover. The rods are attached to an internal fabricated frame, or to brackets bolted to the front intrusion beam. The other ends of the threaded rods carry the driving lights. This way, the lights end up mounted a little lower than the grille. Another important point to note is that most large driving lights are insufficiently stiff in their factory mounts… irrespective of how strong the metalwork is to which they’re bolted. To overcome this, some manufacturers sell adjustable length stays designed to attach the top of each light to the bodywork. However, these straps often don’t match convenient spots on the car where it’s possible to bolt them. An alternative is to make your own straps from flat steel or aluminium, bent to an appropriate shape. Again, this is the approach I’ll take on the Legend. The first step on the Honda legend was to remove the top plastic cover over the radiator and then unclip the grille. This can then be removed without taking off the bumper. Directly behind the grille was a heavy gauge metal box – presumably, in models with radar cruise control, it holds the radar. 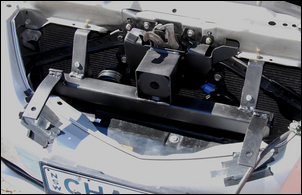 This box was attached to the bonnet locking platform by three 6mm bolts. It looked a good place to start mounting a driving light frame. I unbolted the box and then welded a piece of 40mm square, 2.5mm wall thickness RHS mild steel square tube to it. To provide additional stiffness, I then added two steel lugs (32 x 5mm) that further attached the RHS back to the locking platform. Two more steel lugs (again 32 x 5mm) were then welded to the tube, projecting forwards and providing the mounting spots for the lights. These were angled and shaped so that the grill could be slid up over them, allowing the grille to be replaced with the frame in position. The frame shown here was welded together with a MIG. If you don’t have such a welder, the easiest approach is to buy a very cheap stick welder (about $40 secondhand) and then tack the frame together (tacking is easy). You can then take the frame to a professional welder for final welding. The lights were then mounted on the frame and the stiffness of the system assessed. This is easiest done by ‘bumping’ down on the lights with the end of a closed fist – so inputting a ‘step’ vibration. Doing this showed that the lights had plenty of movement in them – a surprising amount considering the stiffness of the frame and its five pick-up points on the car’s body. I then added some aluminium straps that connected the top of each light to the bodywork. These straps, made from 32 x 5mm aluminium and bent by hand in a vice, were shaped to fit through slots in the grille and so were able to be attached with the grille in place. The big Narvas, previously fitted to a car I owned, already had holes drilled through the upper surface of their housings – I’d used similar straps on the previous car. Note that before you fit these straps, the lights must be properly aimed! With the extra straps fitted, the ‘bump test’ showed much less light movement, so I waited for that evening and then went for a test drive. But I was unhappy with the result – with such a bright beam and long reach, even a tiny movement is easily seen in the beam flickering. The next step was to add long verticals that tied the mounting frame to the base of the car. These verticals, made from 20 x 1.5mm square tube, prevented the bonnet locking platform from twisting (so causing the beam aim to move up and down). The new parts of the frame needed to be made as bolt-ons (otherwise the frame could no longer be inserted and removed) and these new parts attached to a tubular cross-member via four existing 6mm bolts. It was time for another night test drive, and this time the movement of the lights was much reduced. I think most people would have been pretty happy at this stage, but I wondered if I could get the lights even steadier. Especially on dirt and rough bitumen, the lights could still be seen to be moving a little. I’d made the frame as stiff and strong as I thought was pretty well possible, and without pulling half the car to bits there were no stiffer parts of the body to which to bolt it. It was time to take a different approach.